Meningococcal pilus biogenesis and DNA uptake: Neisseria meningitidis is the causative agent of meningitis. Pili are the primary virulence factor of this exclusively human pathogen. The transport of these macromolecular structures across membranes is performed by a complex machinery enabling pilus biogenesis(JBC 2004,2005, J Mol Biol 2006). 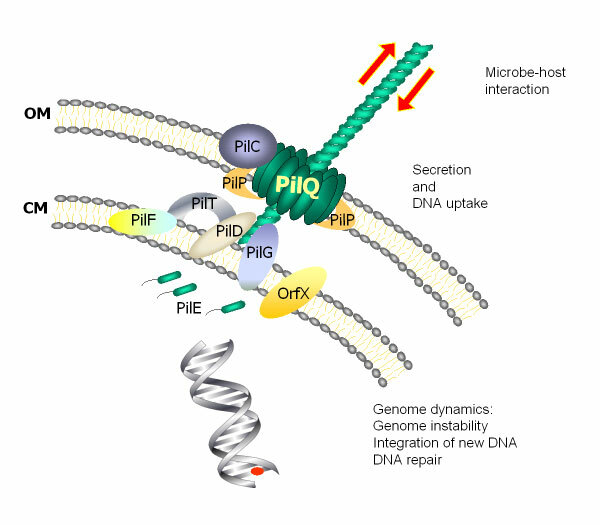 We are characterising the structure-function relationship and interactions of components involved in the membrane transport of pili and DNA (Nature Microbiol. Rev. 2006, Microbiology 2007). Genomics in the search for novel signature DNA sequences: We are using our combined expertise on evolutionary phylogeny, prokaryote cell physiology and comparative genomics to characterize the DNA uptake sequence (DUS) signature sequences and their role in transformation, recombination and evolution. We are also currently defining new tools to target novel DNA binding proteins (Nucl Acids Res 2004, J. Bacteriol 2007). 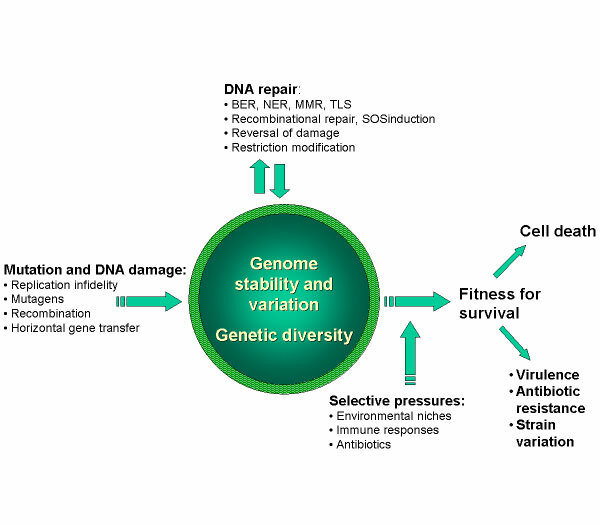 The effect of genome dynamics on microbial fitness for survival and virulence is assessed in a new mouse model for meningitis. Bacteria are injected directly into the CSF and the consequent development of meningitis is monitored in wildtype and transgenic mice (Nature Microbiol. Rev. 2006, Neuroscience 2007). Intracellular survival of Mycobacterium tuberculosis: M. tuberculosis is the cause of tuberculosis. Inside the macrophage phagolysozome, M. tuberculosis faces unusually harsh challenges. We are studying the mechanisms for genome maintenance and thereby fitness for survival in the world’s biggest bacterial killer. Click on the picture for a larger version! You can find an animated version here (330kb)! Click on the picture for a larger version!